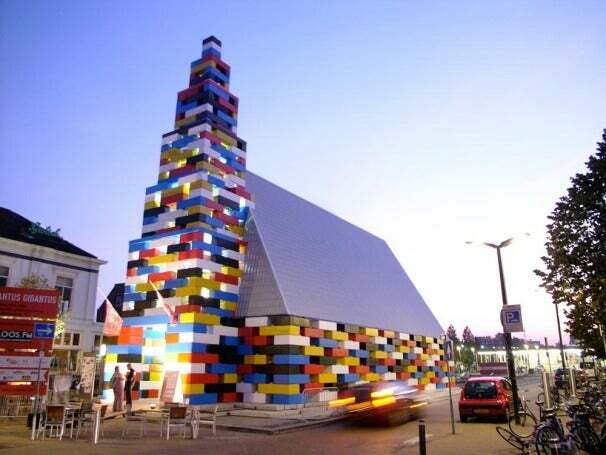 The town of Enschede, Netherlands allowed famed Dutch design firm LOOS.FM to create a 65-foot high spire out of Lego-esque bricks. Intended as a public venue for the week-long 2011 Grenswerk Festival, the temporary building was used as a public venue and held a variety of celebrations--including at one point, a mass. It also held town meetings, raves, concerts, an opera, a sports day, and of course, Lego building contests. 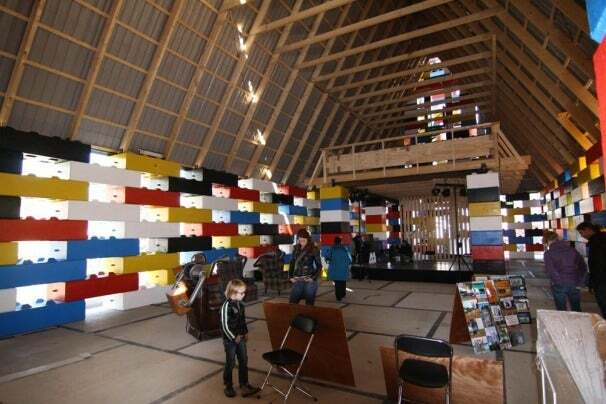 Although they're actually made from concrete, the blocks were constructed to look like Lego (or Duplo) bricks and make up the entire building, save for the roof, and were all painted the five primary colors found in basic Lego sets (red, blue, yellow, black, white). Roughly the size of pyramid stones, the “Legioblocks” are intended to be used (and reused) as stackable construction blocks. The bricks lock together in the same as regular-sized, plastic Legos do, making them a versatile construction material capable of some great creative leaps. To create this structure, the builders stacked blocks together in a loose honeycomb formation, allowing light to come through the spaces and providing a warm, inviting glow to the building. LOOS.FM said that they wanted a structure that would be immediately seen as a place for the public to congregate during the festival. They also highlight the difference in proportion: while Lego's themselves bring up childhood feelings of sentiment and creativity, the scale of the building itself creates a sense of awe. The building, called Abondantus Gigantus, has (sadly) already been dismantled but will be reused in a new form and design for this years festival.